Thanks to Ms. Yingling everyone who needs their 48 Hour Book Challenge fix will - I repeat, WILL - be accommodated. Along with help from Abby the Librarian, they will bring that weekend of guilt-free reading your way starting on June 7th. Check back in with Ms. Yingling for details, and kudos to her for taking on the challenge behind the challenge of running the challenge. While I delayed in figuring out what to do with this community event, I am glad and grateful that it can continue. Read on, dedicated readers. Read on! Thanks for all of your comments of support and friendship on My Most Morose Post. I feel ya, my blogging bros. At this point, I intend to post as I have books to share and things to say. But I felt that my slowing down was too obvious to not address in some way, especially in not arousing concern among regular readers. I swear that I am fine. Lately I'm not often feeling either a rush from writing or a real satisfaction with having written. What I do feel, if I could pinpoint it at all, is a sense of anticipation. That there is something for which I need to prepare. Honestly, with my mom's poor health it could be a bad thing OR with my girls' successes academically and semi-professionally, it could be a good thing. Maybe it's a new direction for my own writing. Or it could be menopause, who knows? Or there is this analogy. 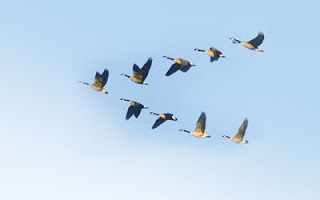 The V formation of migrating geese allows for reduction of wind resistance down the lines, and the birds take turns being in the front, falling back when they get tired. So guys, I'm admitting that I'm tired. But the other benefit of the formation is that allows the group to keep track of every bird, and I know that we do that for each other too. In fact, it's what I love best about our crazy connection of community we call the KidLitosphere. Fly on.